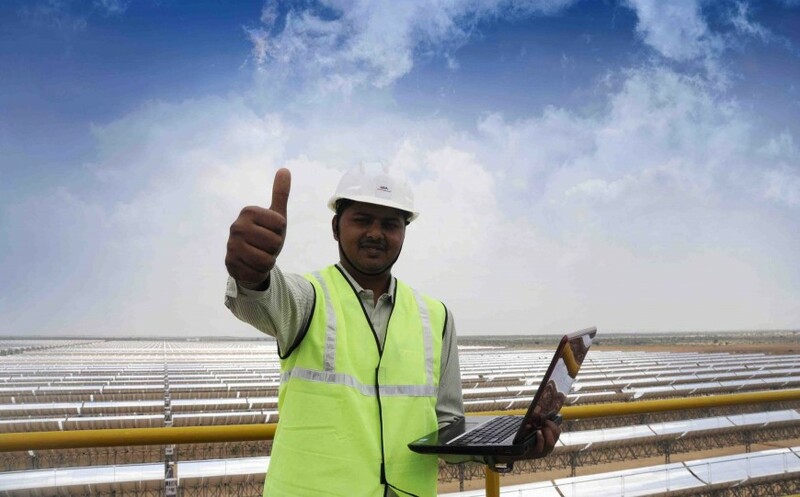 Godawari Green Energy Limited (GGEL) received the commissioning certificate from RREC, the Rajasthan Renewal Energy Corporation Limited, for the first commercial scale Concentrated Solar Power (CSP) plant of India. GGEL, the 100% subsidiary of Godawari Power & Ispat Limited (GPIL) is Chhattisgarhâ€™s leading steel & power company. GGEL received the certificate on recommendation by a committee constituted by Rajasthan State Nodal Agency and authorized by the NTPC Vidyut Vyapar Nigam Limited (NVVN); thus endorsing the 50MW project to be officially and commercially operative with effect from 19th June 2013. Taking a giant leap towards making eco-friendly energy in India, the CSP plant features state of the art parabolic trough, the technology named Euro-trough SKAL ET-150, and had commenced supplying infirm electricity to the grid on 5th June 2013, the â€œWorld Environment Dayâ€. The plant has been built in approximately Rs. 800 Crores (USD 145 million) and is expected to displace approximately 11,30,000 tons of CO2 in a year. The plant is capable of lighting 200,000 Indian homes, while simultaneously preserving the environment. With its achievement, GGEL has been successful in building a road to sustainable energy solutions for India. Siddharth Agrawal, Managing Director of GGEL commented â€œIt was an incredibly tough journey filled with challenges, questions, detours and self doubts, but the GGEL team exceeded the marketâ€™s expectations as far as project construction and commissioning was concerned. This has been a collective effort, and we are grateful to all who helped us realize this dreamâ€. Though the technology is based on solar energy, itâ€™s unique engineering ensures that the power plant can continue to generate electricity long after the sun sets or is obscured by clouds. CSP stations with parabolic trough technology are steam-driven power stations that generate electricity from heat. Parabolic mirrors arranged in long rows concentrate the solar radiation onto the receiver, inside which a carrier liquid is heated to almost 400 degrees Celsius. The heat, in turn, is used to raise steam that drives a conventional steam turbine and creates electricity. The extraordinary aspect about CSP electricity is its dispatch ability in the form of heat. The energy can easily be stored and fed into the grid when power is really needed, be it day or night, cloudy or sunny. This facilitates load management in grids â€“ a factor destined to be of increasing importance as the contribution of solar energy to Indiaâ€™s electricity mix rises. Hira Group is a group of companies founded in 1965 with more than 6000 employees and total revenue in excess of Rs. 3,000 crores in 2012-13. The group is a conglomeration of 14 companies across India and operates independently through its own board of directors and shareholders. The business verticals of Hira Group include Steel, Ferro Alloys, Energy, Mining, Cement, Technology and Real Estate. GGEL & GPIL are part of Hira Group. While group companies Godawari Power and Ispat Ltd. and Hira Ferro Alloys Ltd. are listed on Bombay Stock Exchange India, Godawari Power and Ispat Ltd. is also listed on National Stock Exchange India. GGEL was formed with an objective to tackle the growing energy requirements of the country in an ecologically sustainable manner. The companyâ€™s focus area is power generation using renewable sources such as solar energy, geothermal energy, wind energy, etc. with a mission to strike a balance between people, profit and the planet. GGEL pictures a sound environment, for they are working towards creating more sustainable energy solutions for India and around the world. GGELâ€™s experienced and expert team is targeted towards one goal, clean energy for everyone. HESL expanded its Ferro Alloys manufacturing capacity by addition of a New 15000 MTPA Furnace in Bobbili, Vijayanagaram. This has been increased the production capacity to 84000 MTPA. Started the work of installation of state of the art medium/low carbon manufacture. Facility at Raipur facility, which will produce 40000 MT of Med. And Low carbon Ferro Manganese. Established HIRA CARBONICS PVT. LTD. in the year 2014 with an aim to cater to the requirements of steel plants of High quality Limestone. A Limestone processing unit was installed at Simariya village of Narsinghpur district. To further grow efficiently and exponentially, SAP Enterprise resource planning (ERP) system was implemented. HPSL acquired SANGAM Dolomite mines at Central India with a Dolomite Reserve of 3.5 Million MT. This is one of the biggest Dolomite Mines in Central India. HPSL further expanded its Ferro Alloys manufacturing capacity at Raipur by addition of another 6MVA Furnace of 9000 MTPA Furnace. This increased the production capacity to 63000 MTPA. HPSL achieved the Star Export House status from Government of India. HPSL acquired RVR Smelters P. Ltd Now known as Hira Electro-smelters Ltd. Located at Vijianagaram, Andhra Pradesh having a production capacity of 15000 MTPA at that time. This increased the production capacity of HPSL including its susdiary to 54000 MTPA. To make Company fully integrated, A manganese ore Mine was started at Balaghat district, MP having a production capacity of 15000 MT PA of High and medium Grade Ore. Since Power is the Primary Raw Material in manufacturing of Ferro Alloys, HPSL decided to install a 20 MW Captive Power Plant at Raipur to attain self reliance. Hira Power & Steels introduced Two more furnace at Raipur Site which increased the Production capacity to 12000 MTPA. Mr. O.P. Agrawal acquired a Sick Unit named M/s. Jain Carbides & Chemicals Ltd. situated at Raipur, producing calcium carbide. He re-engineered the Plant to start manufacturing of Ferro Alloys with an initial capacity of 3000 MTPA. This was the FIRST Unit in whole of India to manufacture Ferro alloys (Specially Ferro Silicon) in a tiny Furnace with the capacity of 2.5 MVA. Hira Power & Steels Ltd. Copyright 2014 Hira Group. All rights reserved.